A ceremony was held for the reopening of McFarland State Historic Park in conjunction with the Annual Tour of Historic Florence [last] Saturday. Leah Lewis, granddaughter of Ernest W. McFarland, was Master of Ceremonies. She told about times with her grandfather when she was a small child, saying he was always interested in their school work and encouraged them to further their educations. She also reminded everyone that her grandfather was the only person to hold the three positions of U. S. senator, governor and chief justice of the Arizona Supreme Court. Mayor Vicki Kilvinger related to those present how much the GI Bill had meant to her and her husband. Thanks to Senator McFarland for helping create the GI Bill, her husband was able to complete his education and become a rocket scientist after having served in the military. Her presentation was very touching and inspiring, saying that through the efforts of Senator McFarland, her family’s life as well as that of many other service people, had been made easier. Jim Garrison, State Historic Preservation Officer, explained how the first Pinal County Courthouse was purchased by Ernest McFarland and donated to the Arizona State Parks System to become McFarland Historic State Park. Renee Bahl, executive director of Arizona State Parks, told about the recent renovation of the park. Unfortunately, as construction was nearing completion the state’s economy collapsed and no funding was available to reopen it. Through negotiations, the town of Florence was able to lease and reopen the park with the Florence Main Street Program operating it under the auspices of Manager Jennifer Evans. Jennifer Evans is also the manager of the Florence Visitor Center, also housed at the park. For further information, you may contact her or her assistant, Ken Loerzel at 520-868-4496 or e-mailinfo@florencemainstreet.com. [Source: Florence Reminder, Bonnie Bariola 1-21-2010] — Of the five Arizona State Parks located in Pinal County, only one is slated to remain open. The reason being that in 1976 the Arizona State Parks Board entered into an agreement with the Boyce Thompson Arboretum Board and the University of Arizona to cooperatively manage the park. All funding for the Arboretum from the Arizona State Parks Board will stop, leaving the Arboretum to be funded through the University of Arizona and the Boyce Thompson Foundation. Boyce Thompson Arboretum State Park: Located just west of Superior on US 60, the Arboretum was founded in the 1920s by mining magnate Col. William Boyce Thompson. In 1917 Col. Thompson served as co-leader of a Red Cross mercy mission to Russia, where he came to understand the importance of plants as the ultimate source of a large portion of mankind’s food, clothing, and shelter. It was then that he determined to use his great wealth to improve the use of plant resources. The Arboretum is one of his legacies. [Source: Arizona State Parks] — Pinal County’s first courthouse, built in 1878, has been slowly deteriorating since 2001 while Arizona State Parks has saved Heritage Fund monies to get the building repaired. Today all the buildings at the park closed in anticipation of the re-opening to the public. Structural stabilization of the historic adobe foundation had been slated for completion in 2009. “Unfortunately in recent years, the structural damage from rain has been so bad that we had to close the historic courthouse last October and staff started dismantling the exhibits in preparation of the renovations,” explained Chief of Operations, Janet Hawks. “We have been saving funds in the account so that we could finally repair the rock foundation, wide cracks in the adobe walls, crumbling wood porch, add support beams, and grade the site to prevent further destruction. The deterioration of the foundation poses a threat to the building. We sent bids for construction out last fall, but now everything is on hold until after our February 20th Board meeting,” she said. Governor Ernest McFarland bought the Courthouse in 1974 and donated it to the State Parks department. Another facility behind the Courthouse was built later as a repository for his personal papers. In 1976 the state legislature did not allocate operating funds so the new Park’s opening date was pushed back. It wasn’t until March of 1977, during Arizona’s 20th anniversary, that McFarland State Park was opened to the public and later dedicated by Governor Bruce Babbitt. For 32 years tourists and busloads of children have toured this State Park to experience Arizona’s history and learn how territorial justice was served. They also were taught about Florence’s World War II POW camps and about one of Arizona’s visionary’s, Governor McFarland, who created the State Parks system 52 years ago. Interpretive tours of the park feature the courtroom and judge’s chambers, the sheriff’s office, and the jail. The second story was used as a jury room and quarters for visiting lawmen. Most of the courthouses’ artifacts were moved out just recently, including McFarland’s personal papers. The papers will be transferred to the Arizona Library and Archives’ new state-of-the-art building in Phoenix where researchers will be able to more readily access them. The park staff, who have been preparing for the renovation, will be reassigned to other parks. A new interpretive plan will be introduced once the stabilization is completed. 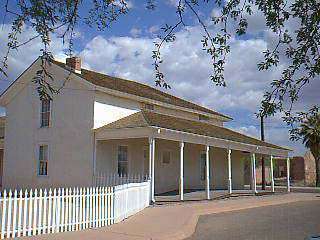 The focus for the new exhibits in the Courthouse will feature Arizona’s Territorial history and law and order. The 1882 jail will be reproduced within the courthouse building. New updated exhibits about Governor “Mac” McFarland and the World War II Florence POW camp will be displayed in the renovated museum and archives buildings. [Source: The Zonie Report, July 28, 2008] — The steady gaze of Ernest McFarland, who in the mid-20th century served Arizona as a U.S. senator, governor, and state supreme court justice, looks down on every visitor to the state park that bears his name, a restored frontier courthouse in dusty Florence, built in 1874. “We will never be perfect in our government, but high ideals can predominate,” reads a brass plaque beneath the portrait, quoting one of McFarland’s favorite sayings. Yet perfection is hardly the word that comes to mind during a tour of McFarland State Historic Park. Massive cracks stretch from floor to ceiling on more than one of the building’s original adobe walls. A support beam braces a crumbling exterior wall, keeping the wall and sections of roof from collapsing. In another room, which over the years served variously as a jail, county hospital and prisoner-of-war camp, caution tape warns visitors to avoid a gaping hole in the floor.